Vancouver, B.C……..Corvus Gold Inc. (“Corvus” or the “Company”) - (TSX: KOR, OTCQX: CORVF) announces the results from its follow-up resource expansion program on its North Bullfrog project near Beatty, Nevada. The updated independent estimate has expanded the District wide Indicated gold resource to 182,000 contained ounces at an average grade of 0.37 g/t, plus an additional Inferred gold resource of 1,410,000 contained ounces at an average grade of 0.28 g/t, both at a cutoff grade of 0.20 g/t gold (see Table 1). This new, much larger resource reflects a major new discovery in the northern part of the Company’s land area which is composed of three deposits separated by large undrilled areas. In addition, some of the resource areas contain higher grade resources as well as high-grade vein systems which could be targets for early mining (see Table 2). The Company has began acquiring the necessary information required for completion of a Preliminary Economic Assessment, as well as designing and permitting a major follow up grid drilling resource expansion program which will focus on both the bulk tonnage and high-grade vein potential of the area. * Mineral resources which are not mineral reserves do not have demonstrated economic viability. The estimate of mineral resources may be materially affected by environmental, permitting, legal, marketing, or other relevant issues. The resource update is focused on 4 of several targets in the North Bullfrog District, all of which remain open with potential to grow significantly (Figure 1). The primary host unit for the majority of the resource is a thick, oxidized, shallowly dipping volcanic unit which is commonly exposed at surface, thereby offering the potential for very low strip ratio. The continuity of the mineralization within the primary host unit is considered to be very good, and there is a high probability that the resource will increase with future step-out and infill drilling around the current widely-spaced holes. In addition, the individually reported deposits are separated by undrilled areas which have projections of the favourable host unit between them, and which could therefore offer additional potential for resource expansion. Approximately 57% of the current estimated resource is oxide material occurring at surface, which has returned highly encouraging cyanide bottle roll test results suggesting potential for low cost heap leach recovery (Table 3). Ongoing metallurgical work is focusing on evaluating the potential of the bulk tonnage oxide deposits for heap leaching and, in particular, coarse “run of mine” material. The North Bullfrog property has a large number of areas that the Company believes would be suitable for a large heap leach operation as well as ready access to key infrastructure and water. Figure 1: Corvus land position at North Bullfrog showing areas where resources have been defined. Drill collar locations are shown for reference. Drilling at the North Bullfrog project has returned a number of high-grade drill intersections similar to the historic high-grade veins that were mined 7 kilometres to the south in the main Bullfrog district. Several high-grade gold and silver veins have been encountered in a number of areas, such as Yellowjacket (6.1m @ 11.9 g/t gold and 8.8 g/t silver), Mayflower (9.1m @ 7.18 g/t gold & 15.2m @ 2.87 g/t gold) and Connection (6.1m @ 2.67 g/t gold & 15.2m @ 2.44 g/t gold). As part of its follow-up grid drilling program, the Company will be targeting high-grade structural zones to evaluate this promising style of mineralization. The Company retained Mr. Gary Giroux, M.Sc., P.Eng. of Giroux Consultants Ltd. to prepare an updated mineral resource estimate for the North Bullfrog project. The updated mineral resource estimate for each area of North Bullfrog (see Table 2) is based on three dimensional geologic models developed by Corvus geologists using geology logs from the drill holes along with alteration and geochemical data. The grade distributions for gold and silver were evaluated using lognormal cumulative frequency plots for samples within both the mineralized solid and the surrounding waste. Drill holes were compared to the mineralized solids and the points each hole entered and left the solids were recorded. Uniform down hole composites, 5+/- 2.5 metres in length, were formed and made to honour the solid boundaries. 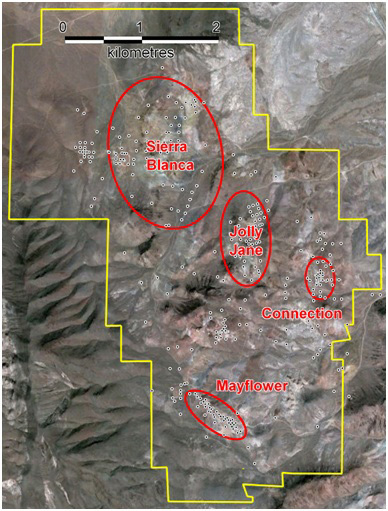 Pairwise relative semivariograms were produced from composites within the mineralized solid for both gold and silver. For this resource estimate, the averages of the specific gravities for numerous samples were used to calculate the densities for the different geologic units in the models. A block model with blocks 10 x 10 x 5 metres in dimension was superimposed over the mineralized solids. At Mayflower the model was rotated 45 degrees to better fit the solid but other areas were not rotated. Grades for gold and silver were interpolated into all blocks, with some percentage within the mineralized solid, by ordinary Kriging. Corvus will file the full NI 43-101 resource report on SEDAR by November 11th 2011. The bottle roll tests were conducted on 75 micron material from oxidized and partially oxidized RC drill samples collected at various North Bullfrog prospects. The four hour recovery indicates the percentage of gold that went into solution in the first four hours. The total recovery indicates the total amount of gold that was dissolved in 72 hours. Corvus controls 100% of its North Bullfrog Project, which covers approximately 24 square kilometres in southern Nevada just north of the historic Bullfrog gold mine formerly operated by Barrick. The property package is made up of a number of private mineral leases of patented federal mining claims and 161 federal unpatented mining claims. The project has excellent infrastructure, being adjacent to a major highway and power corridor. The work program at North Bullfrog was designed and supervised by Russell Myers (CPG 11433), President of Corvus, and Mark Reischman, Corvus Nevada Exploration Manager, who are responsible for all aspects of the work, including the quality control/quality assurance program. On-site personnel at the project log and track all samples prior to sealing and shipping. All sample shipments are sealed and shipped to ALS Chemex in Reno, Nevada, for preparation and then on to ALS Chemex in Reno, Nevada, or Vancouver, B.C., for assaying. ALS Chemex’s quality system complies with the requirements for the International Standards ISO 9001:2000 and ISO 17025:1999. Analytical accuracy and precision are monitored by the analysis of reagent blanks, reference material and replicate samples. Quality control is further assured by the use of international and in-house standards. Finally, representative blind duplicate samples are forwarded to ALS Chemex and an ISO compliant third party laboratory for additional quality control.